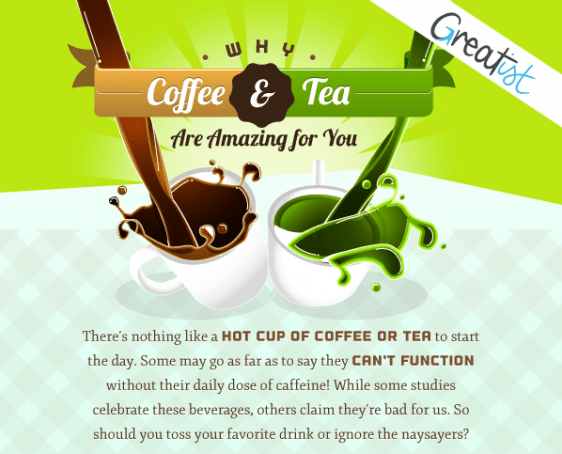 There are so many benefits associated with consuming tea and coffee. It is a shame to notice the fact that so many do not actually know this. There are huge debates about which one is better. Some people will tell you that tea is definitely better and many see coffee as being the one you should choose. The truth is that we are faced with two drinks that are underestimated by many. This is definitely something that you should not do. While not all people can drink coffee and some types of tea, there are options that are available at all times. The infographic that you can take a look below is definitely interesting since it offers so much information that you can use in order to quickly figure out what you should be consuming. You will learn about the main benefits that are associated with both coffee and tea consumption. That aids you since you can see what diseases and conditions you can actually treat or get help in treatment through the consumption of these liquids. You will also learn about the various types of tea and coffee that you can consume. One thing that many do not understand is that different coffee types and different teas can aid you quite a lot based on the conditions that you want to tackle. The infographic automatically shows you the benefits, how much you should drink and why but it also aids you in understanding how much you should consume during the day. As with every single thing that you may consume, there are cases in which problems appear. Moderation is definitely the key where. Never drink more than 3 to 4 cups of coffee or 4 to 6 cups of tea on a daily basis. If you do not do this, you may end up with anxiety, insomnia or restlessness. Besides the infographic, make sure that you also check out the source that is mentioned below. This is because it will offer even more information about tea and coffee, the two drinks that people underestimate at all times. Keep in mind that a mild addiction can appear but you do want to be sure that you consider the consumption because of what is presented in the infographic.